If you are a freelancer, a consultant, or a small business owner who does a lot of sales calls, the estimate and the invoice are simply facts of life. An app that lets you use your iPhone or iPod touch to generate professional invoices, estimates, purchase orders, and credit memos for your clients in a snap would be a valuable utility. Invoice2Go from Invoice2go.com proposes to be such an app, yet falls short in the most obvious way to just about anyone reading this on Macworld.com. Invoice Optimization: Invoice2Go guides you through the process of setting up an invoice, with all sorts of customization options. The problem with Invoice2Go is that it’s an iPhone app that completely shuts out Mac users. Invoice2Go’s companion desktop application works only with Windows. (You don’t need the desktop application, but it helps.) Although it’s certainly true that PCs still rule the business world, it’s hardly true that everyone generating these documents are stuck on a Windows platform. Gee whiz, haven’t these guys heard of cross-platform compatibility? In any event, the developers encourage Mac users with Intel machines to simply install Windows to take advantage of Invoice2Go’s fine features, which are many. 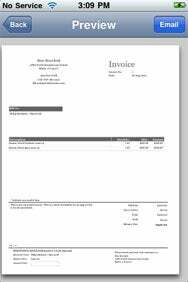 The Invoice2Go app is supposed to let you create an invoice from ten templates or from a document of your own design, which you can then review and e-mail directly from your handheld device. And, in fact, creating invoices is easy. Invoices2Go guides you gently through the set up, allowing you to customize your quantities and rates, add product codes and custom shipping fields, and include or delete remittance information as you choose. Once you’ve settled on your template, simply tap the document type you want to create under the “new” menu. You can also review and edit older invoices, which Invoice2Go saves in a folder. Add your customer’s name, either directly or from your iPhone’s address book. Then add items to the invoice. You can set up a product list or enter items manually. You can also edit when payment is due—from the same day up to a year from when you generate the invoice. Invoice2Go will then tabulate your subtotal, calculate the tax, and generate a balance due. You can even add a Paypal button so your clients can pay you conveniently online. The app also keeps track of your invoice due dates and what you’re owed, which is a must for the independent contractor on the go. Tap the “actions” button in the upper-right corner of your screen, and you can save, preview, e-mail or export the document. If you preview, Invoice2Go lets you zoom in and out with a pinch and a squeeze. Sneak Peek: Invoice2Go lets you preview invoices, though in my testing, that’s where the trouble began. Only when previewing the invoice to send does Invoice2Go occasionally hit a snag. The app took four minutes to generate a preview for me to review before sending, and then timed out. And it was a small invoice, with just two items. That’s when I discovered that Invoice2Go requires a live Internet connection for previews (and exports, obviously). Invoice2Go does have offline support for managing and creating new invoices, however. Invoice2Go offers a lite version of the app, which lets you create and manage up to three invoices at a time. I would recommend anyone interested in a powerful, feature-rich invoicing app try the free version first. But if you are a Mac user, Invoice2Go is probably more trouble than it’s worth. 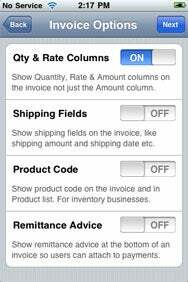 Invoice2Go is compatible with any iPhone or iPod touch running the iPhone 2.x software update.